If, like many people, you pick up stakes and move yourself, your pets and your possessions into a new home in a new town, you may find that you’ve unexpectedly run afoul of the law. In fact, you may face a choice between surrendering a beloved dog to be put to death by the authorities, or else reversing that change of address. That’s because many jurisdictions throughout the United States — and elsewhere — limit the breeds of dogs you are allowed to have, and even completely forbid some breeds. 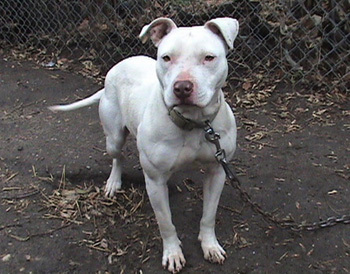 Pit Bulls rank prominently among such forbidden pooches. Pit Bulls have been targeted because of mistaken perceptions that they are temperamentally more aggressive than other breeds, or physically more dangerous. Some of the bans have been premised on claims of extraordinary biting power or “locking” jaws supposedly possessed by Pit Bulls. But the American Temperament Test Society, a national non-profit organization that uses uniform standards for evaluating the temperament of dogs and then breaks the results out by breed, reports that 85.3 percent of American Pit Bull Terriers and 83.9 percent of American Staffordshire Terriers have passed its tests. Compare that to 81 percent of Beagles, 79.4 percent of Collies, 76.6 percent of Old English Sheepdogs and 71.1 percent of Chihuahuas (but 90 percent of Irish Setters!). Pit Bulls are more likely to pass a temperament test than are Beagles, Collies, and Old English Sheepdogs. Basically, there’s no evidence that Pit Bulls are especially mean or dangerous. Nothing in particular distinguishes them from other dogs. But don’t expect facts to stand in the way of a good panic. Pit bulls are banned in Britain, Denmark, Germany and other countries. Australia requires that Pit Bulls be neutered and bans their import, with the ultimate intention of eliminating such dogs. Singapore permits Pit Bulls only if the dogs are sterilized, muzzled and covered by $100,000 liability insurance policies. Enforcement can be harsh, with fines for people, and exile or even impoundment for animals. In Denver, where dogs are identified by city workers according to a checklist of visual cues (with a high rate of mistaken IDs), thousands of dogs have been killed by animal control officials. This has resulted, at times, in piles of bodies that have accumulated faster than they can be shipped out for rough disposal. All of this, remember, for dogs that are not especially aggressive or dangerous — dogs just like Petey from the popular Our Gang/Little Rascals movies and Tige, the mascot of the Buster Brown brand of shoes. Although mostly forgotten today, one Pit Bull, Sergeant Stubby, became the only dog promoted in rank in American military history in recognition of his efforts in warning his unit of poison gas attacks and incoming artillery shells, locating wounded soldiers and capturing a German spy. The fact that Pit Bulls have more of a history of affection, entertainment and heroism than aggression isn’t just a triumph of panic over reason; it’s a repetition of a sad historical cycle. Dog breeds vilified as especially vicious in the past have included bloodhounds, German Shepherds and Weimaraners. Each, in its day, was seen as especially dangerous — only to see the mantle of canine pariah eventually pass to a new, unfairly targeted breed. This article originally appeared on StubbyDog.org.